I watched OLIVER & COMPANY (1988) on 11.9.13. It was my first viewing of the film, though I definitely saw pieces of it as a kid. OLIVER & COMPANY was made in 1988. The previous movie made by Disney was THE GREAT MOUSE DETECTIVE in ’86, unless you want to count the Hyperion Animation/Disney co-production of THE BRAVE LITTLE TOASTER. After OLIVER & COMPANY, Disney’s next film was the 1989 LITTLE MERMAID which launched the last Golden Age of Disney hand-drawn animated film, lasting well into the 1990s. OLIVER & COMPANY is, then, a movie caught between eras. At 74 minutes it is one of the last really short Disney films, with most of its successors coming in at least ten minutes longer. This film uses some computer animation, but not in a way we would modernly identify as sophisticated. The movie is truly dark, with the characters lives’ truly facing genuine danger. It is an odd movie. It is set in modern New York City. The animators left everything in. The twin towers stand grandly over the opening drawing. The logos of Diet Coke, Sony, Kodak, and anything else regularly seen in the NYC landscape will be identifiable as well. It feels a little jarring to see this sort of product placement in an animated movie, though that is offset by the fact that all the animators are doing is drawing what they see without discrimination. The low angle shots from a dog or cat’s point of view are nicely conceptualized and nicely realized. Because, yes, this is a dog and cat movie. The cat in question is the titular Oliver as this film is an animated telling of the Oliver Twist story. Adding to the oddity is the cast. Oliver is played by (“Woah!”) a twelve year old Joey Lawrence. His new pal Dodger is voiced, in dialogue and song, by Billy Joel. The chihuahua, in true stereotypical casting fashion, is done by Cheech Marin. Fagin, the human compatriot of the gang of dogs and cat, is played by Dom DeLuise. The voice of the stuck up pretty-dog Georgette is Bette Midler. Robert Loggia voices the villain Sykes. It is a truly odd mix of humans making up these characters, yet it really does work. I would never peg Billy Joel’s speaking voice, but he provides a bit of NYC edge to Dodger. I guess there really wasn’t anyone more NYC than Billy Joel in 1988. The story is simple. Oliver is a cat without a home. A gang of dogs brings him in. The gang’s human leader Fagin is out of money and owes plenty of it to Sykes. The animals band together to try and bring some money in. In doing so, Oliver ends up at the home of a little girl who takes him in. The little girl ends up in danger and they gang has to save her. The danger is oddly real. Maybe its the setting of actual subways, parks, and bridges around New York City, but the action feels immediate and the violence more legitimate. This is not a Disney fantasy land filled with magic lamps, mermaids, or monstrous beasts living in big castles. Instead, this is Disney by way of an urban landscape which uses guns the way a live action movie would, and which is ruthless to those who would do our main characters wrong. It works more than many of the films from that era do. If only it wasn’t so concerned about being a musical. Maybe having Billy Joel and Bette Midler means you have to have songs, or maybe they looked to cast those folks because of the musical bits. Either way, any music beyond a decent opening number, only serves to derail the movie. This turned out to be a surprisingly useful and dark animated movie. Glad my son was really interested in seeing a “kitty movie” and made me watch it with him. In an animated film, the ACTING score reflects both the voice acting and the ability of the animators to convincingly create character. Think of it as ‘character creation’, and all that entails, more than just acting. Sorry, but I have higher standards for songs in an animated film. My philosophy is to get it right, or leave them out. 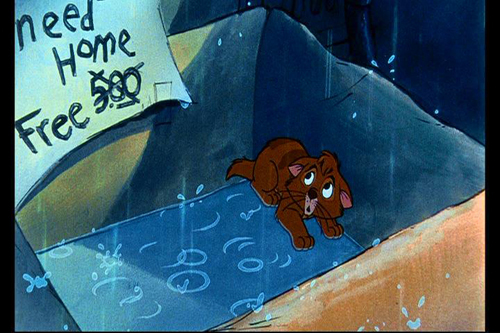 The negative bonus point tells the story with the songs of OLIVER & COMPANY. ~ by johnlink00 on November 10, 2013.